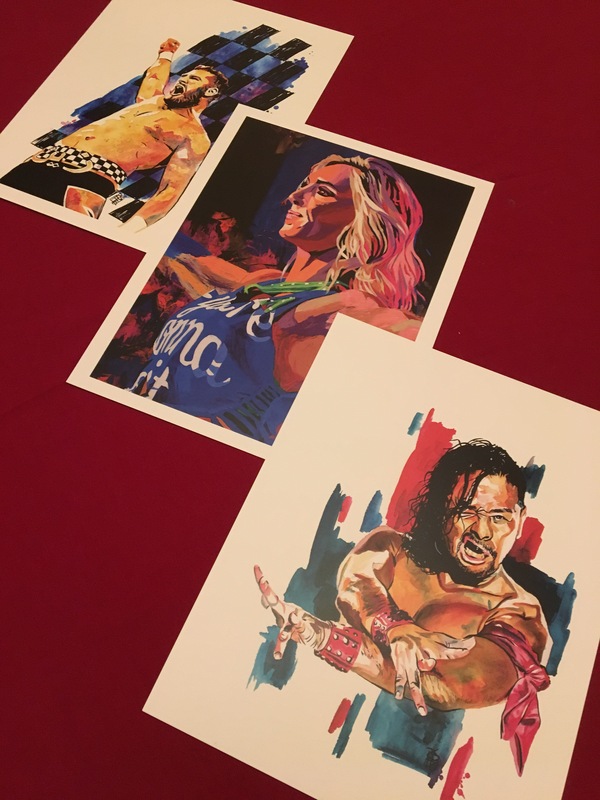 Last week, I mentioned the killer print sale by WWE’s Artist-in-Residence, Rob Schamberger, and I snapped up a handful of prints I previously missed out on due to hesitation1. My Black Friday shopping happened two weeks late, but I got such an incredible deal. Actually, I got more than I bargained for because someone decided to make a little holiday magic. If you don’t believe in holiday magic, let me prove you wrong right now because someone intercepted my holiday letter! When I opened the carefully packaged prints. I slowly admired each one before setting it aside to see who popped up next. Looking at the stack, it seemed thicker than it should have been. First was Sami (top), then Charlotte (middle) followed by Shinsuke (bottom). My heart skipped beat when I moved Shinsuke to the side, to find that the stack continued. If you’ve following this series2, you’ll be fully aware that I was late to the Schamberger pARTy. I plummeted down his Canvas 2 Canvas YouTube video rabbit hole, instantly kicking myself for missing out on so many beautiful works of art. Seeing his posts from different conventions around the midwest as well as from WrestleMania, made me wish I could hop a plane like I used to so I could scour his booth for treasure! (I might have a secret Pinterest board with the C2C images I wish to one day make into a gallery wall for my master suite.) 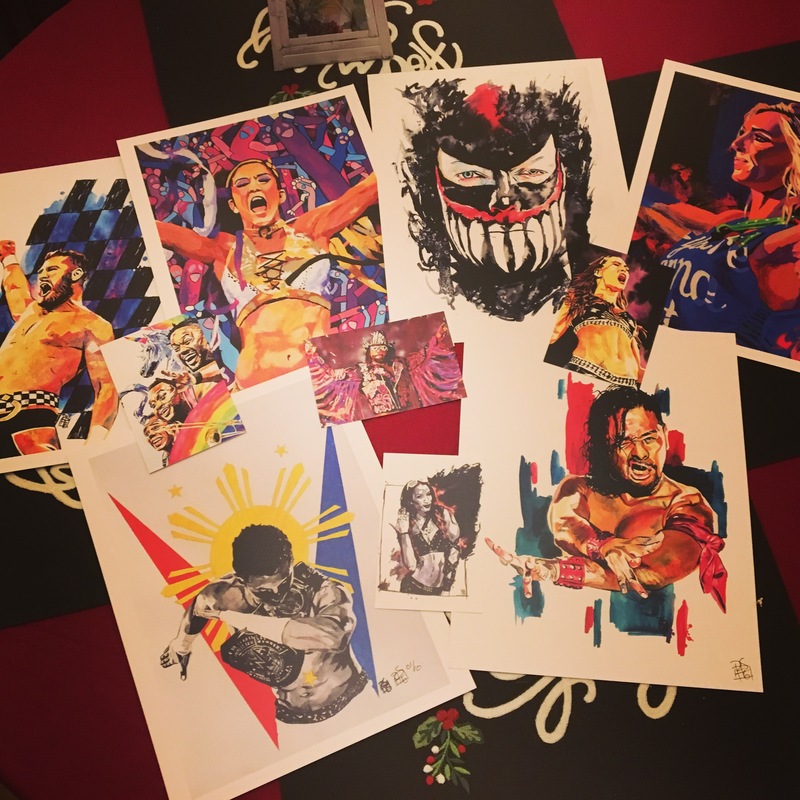 Exceptional kindness of the artist’s part made my shopping task list significantly shorter as three elusive 11″x14″ prints stowed away in my order! Three MORE Champions have arrived! Finn is one of the Superstars on the bucket list of folks I wish to eventually meet. I’m slightly late to the Bálor Club, but I did see him main event several house shows before he headed up to the main roster. Had I followed pro wrestling when I lived in Japan, I might be celebrating my tenth year in the Demon King’s fan club as he debuted in New Japan Pro Wrestling in 2006. Seeing him winning the Universal Championship earlier this year was amazing but devastating when he vacated the title shortly there after due to an injury. As I eagerly await his return, I’ll have a little Demon to watch over me. In this rendition of Finn, I love how piercing his Irish eyes are in contrast to the signature Demon red, white and black war paint. While it may be one of the darker images in my collection, it helps counterbalance all the colorful ones as well as the silver walls. 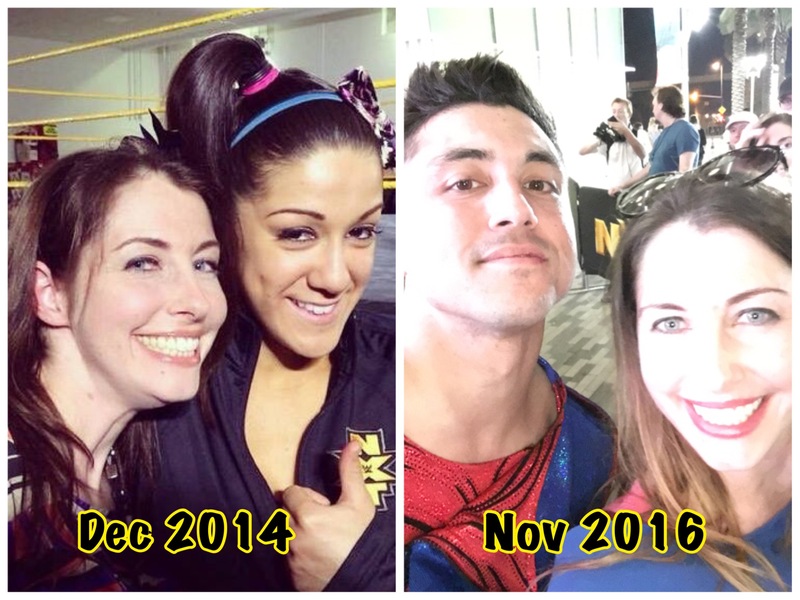 When I first started following NXT in fall 2014, I met Bayley at two different house shows at the Orlando Armory. Like Sami, Bayley is the ultimate underdog and over the past two years, I’ve become so emotionally invested in her career. Seeing her on the main roster makes me so thrilled for her, but I miss seeing her dominating in NXT. There have been several pieces featuring Bayley, but this design features my favorite match that I’ve ever seen her in: NXT TakeOver: Brooklyn. These women tore the roof off the Barclay’s Center, making it easily the best match of 2015. The eternal optimist walked out NXT Women’s Champion, and brought me to tears. This print is my favorite because it not only evokes emotion, but it serves as a reminder that good girls don’t always finish last! As a lifelong proponent of Hug Life paired with meeting this inspirational woman, I am thrilled that I could add the design I wanted most! You want to talk about a virtual hug? This was a completely perfect one! Attending the Cruiser Weight Classic Quarterfinals at Full Sail University was one of my highlights of 2016. Initially, I kept getting mad at T.J. because he kept busting my CWC brackets, beating all of my picks against him: Johnny Gargano, Rich Swann, and Kota Ibushi! Yet, when it came to the finale against Gran Metalik, I’m certain my neighbors thought I was watching soccer match with how loud I was screaming for TJP… alone… in my home3… with the dog. My eyes got misty as he celebrated in a blizzard of victory confetti because he is the perfect storm of perseverance, charisma and athletic ability. As the first Cruiser Weight Champion in the new WWE era, T.J. emerged on the main roster with a new, heavily nerd-inspired entrance, and I couldn’t be prouder! When I got to the bottom of the stack and saw what could be best described as the unicorn of my Schamberger collection, I fought to maintain my composure. Toeing the line between crying and rejoicing was incredibly difficult. Unlike the other prints, this one was signed and numbered, meaning it was one of the original ten released shortly after the tournament in late September and were gone instantly! Bonus Round: Mini-Hall of Champions?! Just when my heart couldn’t be more full, it ran completely over. I sat down and took a moment to look at the smaller prints included. Along with a smaller version of Hugs, six other SuperStars made their way to the Lil House of the Nerdy! Five fab 4″x6″ prints?! I can’t even! Wrestling has become an avenue where I’ve built treasured friendships, met lovely Superstars, and created fantastic memories. Did I ever think this passion would integrate itself into my home decor? Not at all, but I am glad that it has taken root! It’s isn’t just about packing The Lil House of the Nerdy with cool stuff. Honest. I sound like a broken record when I talk about supporting independent artists and small businesses, but building that connection makes the collection experience have substance. I am a completely unapologetic Schamberger fangirl. When your friend makes you cry in the best possible way! Have you ever sent a thank you card to someone you’ve never met in person? 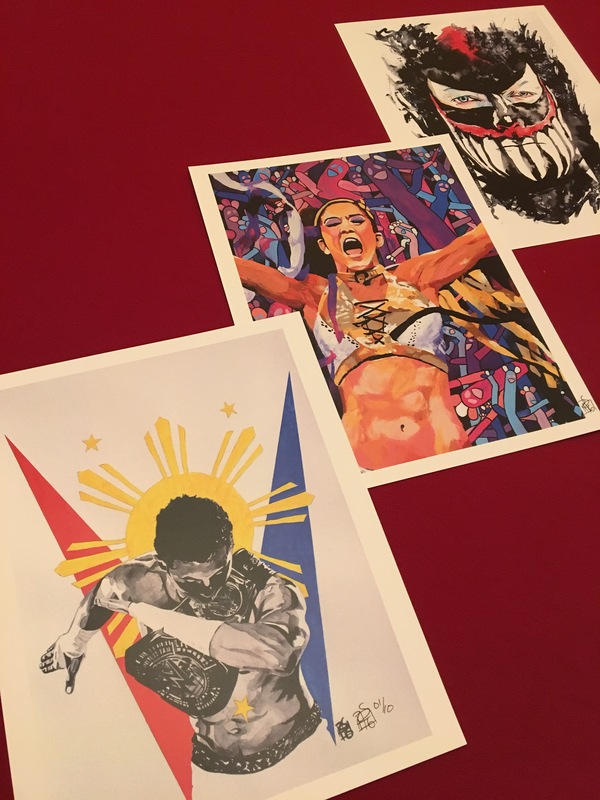 With WrestleMania here in Orlando in April, should I bring these to the AXXESS fan convention to get signed? 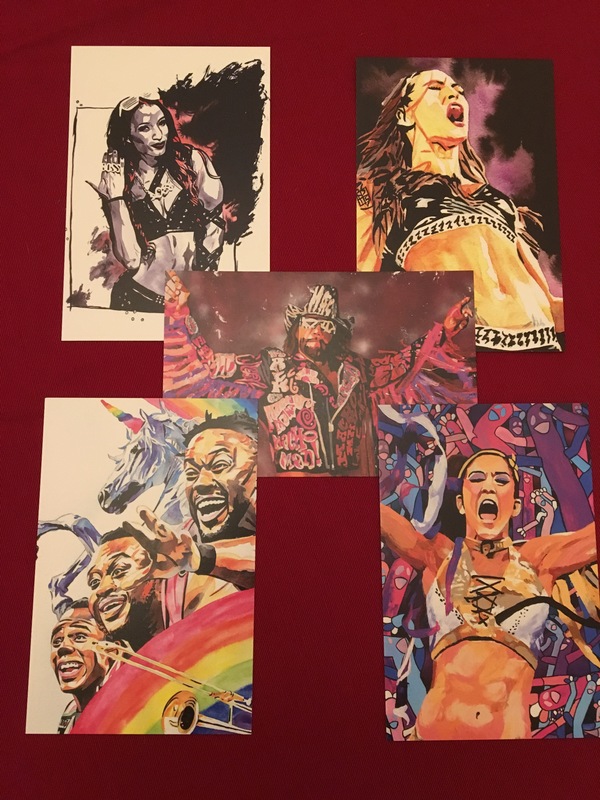 Should I take these to WM33, what would be the best way to transport my art to keep it protected, but not cumbersome to carry? Again, not a paid advert. I’m just a fan of good people making the world a more beautiful place. The Schambergers are some of those people! I desperately tried to get a ticket to the CWC Finals at Full Sail. It wasn’t until during the show when I tweeted how much I wished I was there, and I got a handful of tweets of people who gave away extra tickets! Ahhhhh!! Next year, I am not going to miss out! Two years ago, I met Bayley at my first house show in Orlando. Last month, I met T.J. Perkins at the WrestleMania 33 Presale Party in downtown Orlando! Love them, Cali Kids!